When homeowners experience pipe leaks and other water disasters, they can stay calm knowing they can call the water damage Acworth crew at 911 Restoration Atlanta. Water that is left untreated can lead to serious water damage throughout your home, so it is important to know how to protect yourself before hand and know when to call the Acworth flood removal pros. Our Acworth water removal operatives suggest you use a back flow valve to protect your plumbing from rain flooding through the pipes and toilet overflow. You can also insulate your water line to shield it from the cold. The more time you spend protecting your home, the lower the chance will be that you experience loss from a water disaster, so call us today and let us start restorative process as soon as you need them! If water damage does occur on your property, then the Acworth water removal agents will make sure to be on site within 45 minutes in order to minimize the permanent damage done to the structure of the home. We want to be there to provide you a fresh start at all hours of the day, so we keep our offices available 24/7/365. 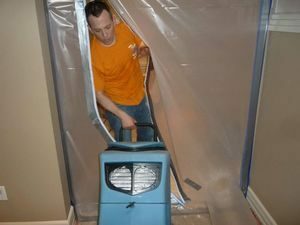 The Acworth floodwater mitigation staff knows that a quick cleanup time is essential to reduce the chances of mold and fungus growth. When your home is struck by a pipe burst, roof leak, flood or sewage backup, you can trust that the Acworth water disaster restoration agents will get there in under an hour. Our IICRC certified techs further helps reassure customers that we know exactly how to get your home clean. We use the latest water extraction and drying technology to get your home up and running again in no time. Customer service is key to us, so call the Acworth leak repair service agents and let us do all we can to make your home the safe, familiar environment you know and love. More often than not, the water related disasters that the Acworth flood damage teams encounter are from issues that occur inside the home, but every now and again, we get called to remediate a circumstance where the water invades from outside the home. An example of this is when the garden watering system gets clogged, sending a water backup into the home. Situations like this are rare, but they do still happen, and no matter what the issue, the Acworth water extraction specialists will be there to help homeowners restore their home. Quick service and the ability to prioritize the needs of the customer no matter what time of day, or how big the project is, is what keeps the Acworth floodwater damage pros the most trusted source for restorations in Atlanta. Call our water damage Acworth restoration service professionals with 911 Restoration Atlanta as soon as you discover unwanted water in your home. We know exactly how to give you and your family a fresh start today!